I’ve been on the road since midnight, and the sun is about to rise at the boat ramp. I’m running on adrenaline and caffeine, and squinting at red taillights as the brakes on the truck lock up and the boat slides off the trailer. It hits the water, and I instinctively trim the outboard and turn it over. As we head out into Cape Cod Bay toward Race Point, a cold, salty mist sprays our faces. Finally. We scarf down bagels during the 30-minute run to the point, attentive to the slightest splash or diving bird. It’s been a long winter, and much like the fish we chase, we have made the migration to quench our hunger for striped bass. 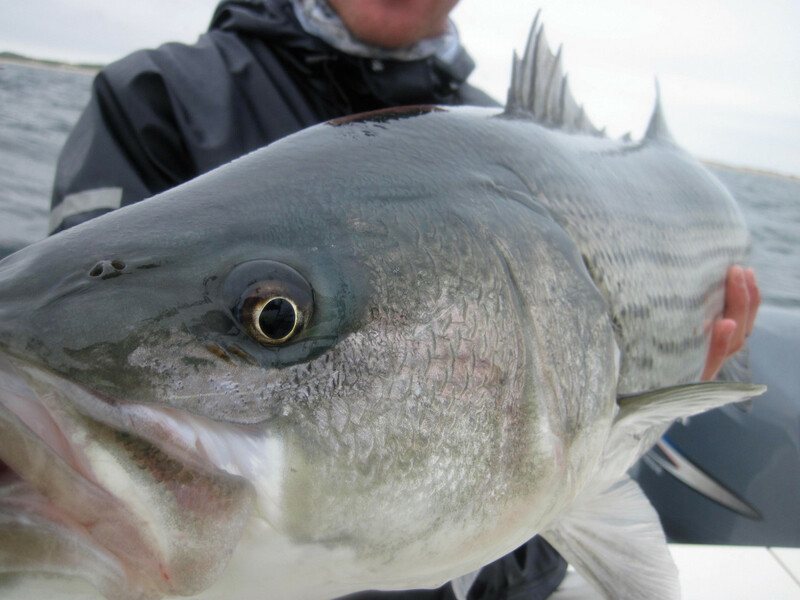 This is cutthroat, play-for-keeps fishing with a crew of accomplished charter captains. Everyone has proved himself to the others. 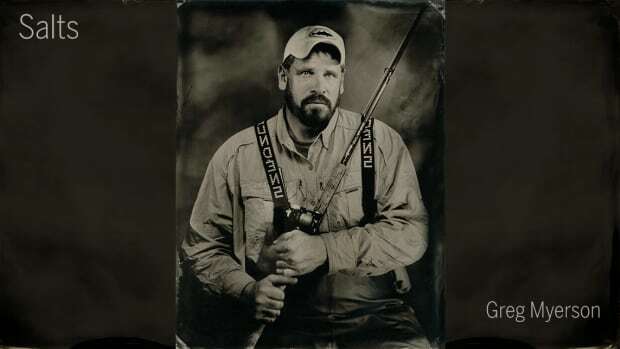 Everyone rigs his own rods and lands his own fish — and had better put in his time on the wheel. If any of us gets a fish boat-side that drives someone to say That’s a nice fish, he might get a little assistance, maybe even a willing participant to snap a photo. We’re all friends, and we all fish hard. A disturbance on the horizon catches Capt. Cody Lapnow’s attention. I push the throttle forward, and the vessel jumps ahead, picking up speed as we approach breaking fish. We move in unison, ready, rods in hand. Wonderful, violent eruptions are everywhere. It’s as if someone is dropping cinder blocks into the sea. We’ve come for what lies beneath. It’s our winter dreams come true. 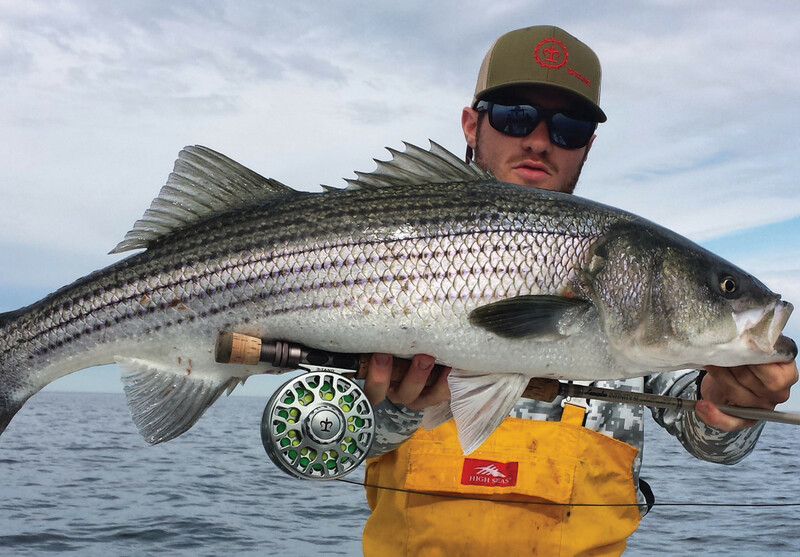 Many who live in the Northeast and Mid- Atlantic devote long hours to pursuing stripers. 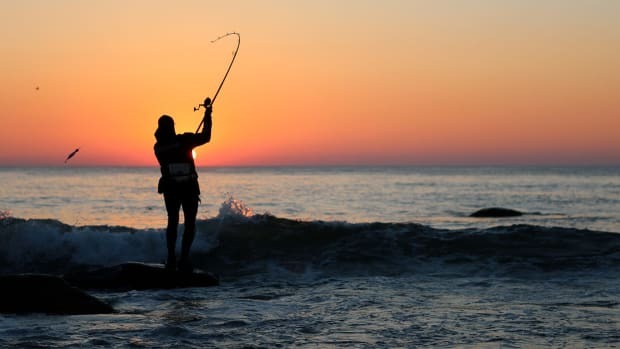 We all take pride in our home fisheries, but not all fisheries are created equal, and exploring new waters helps you grow and improve as an angler. Figuring out a new fishery is a puzzle with opportunity and risk. If you want success, you need to do your homework, put in your time, understand the importance of trial and error, and be willing to fail. About six years ago, Cody and I were working at a fishing shop. 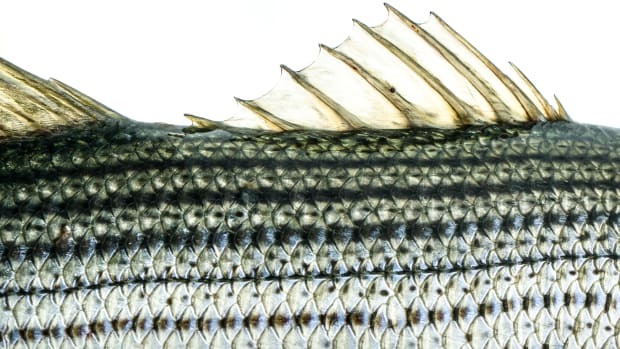 We were in our late teenage years, and we’d heard reports of a good spring striped bass bite off Cape Cod, Massachusetts. Who could resist? We borrowed boats, trucks, trailers and lodging from friends and family. Capt. Cory Crochetiere was a crucial part of that first trip, and his intel drove our success. Although he was on his own boat during the initial outing, Cory has fished with us every year since; his angling knowledge has made all of us better Cape fishermen. Our objective has remained constant: catch and release as many fish as we can, and try to stick some big cows in the process. 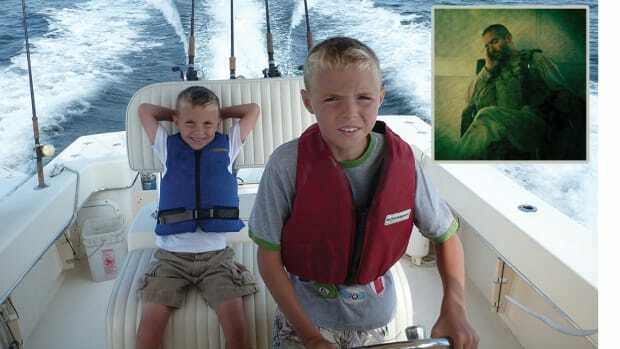 Since the start, we plan the trip around a simple rule: no fishing on weekends. We leave Connecticut at midnight on a Sunday in early June and drive straight to the Outer Cape. The first day is a battle with exhaustion. We have a deal with a local gas station to buy all our gas there in exchange for nightly trailer storage. 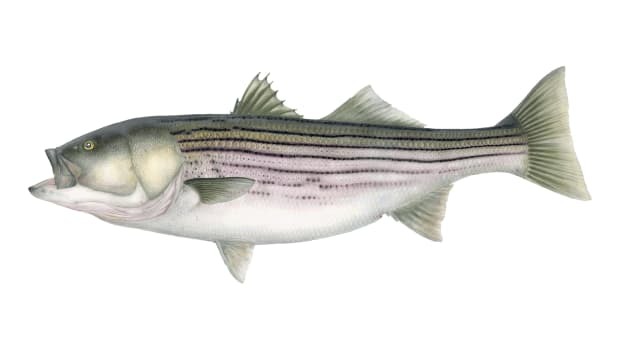 We get to refuel and rest our heads for a few short hours at my family’s cottage in Wellfleet before the alarms go off at 3:30 a.m.
Spring stripers are partial to soft plastics, poppers and flies. Everyone casts in harmony as the boat slows and the blitz comes within reach. I spot slashes of iridescent stripes. 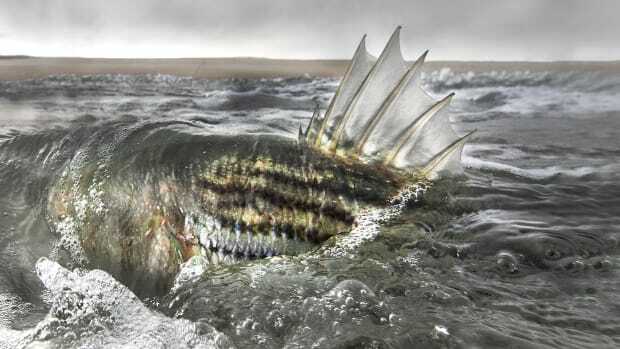 Striped bass erupt from the depths with flaring gills and explosive tail slaps as they maraud balled-up schools of sand eels and mackerel. 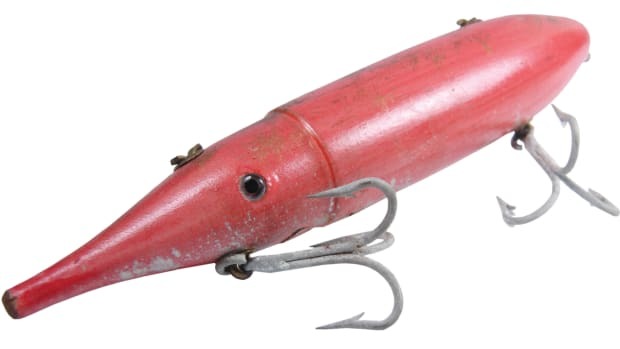 Ten- to 25-pound fish crash bait at the surface. My heart pounds. The boys heave big, soft plastics, poppers and flies at the splashes. Cody hooks up first, and I shuffle away from the helm, grabbing a rod out of the leaning-post rocket launcher and releasing a cast in one fluid movement. With my rod tip low, the unweighted soft plastic dances across the surface with convincing twitches. A boil appears behind the lure. I pause the bait and feel it get devoured. The fish does most of the work setting the hook as it puts its shoulders down and begins to lighten my spool. The boys communicate and act quickly, avoiding one another’s lines and bodies. 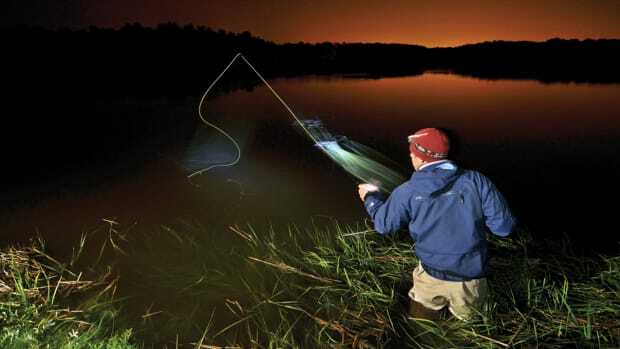 In less than a minute, all of us are tight to fish, pulling hard as our drags sing. The hooked fish come to the surface when they’re ready, and we each reach down and grasp the fluorocarbon leaders to maintain control. As I direct my thumb into the mouth of my fish, a connection is formed. I feel the power and weight of this animal before popping the hook and releasing it. The repetition provides therapeutic elation. Catch, release, repeat. Our surroundings include a bevy of wildlife. Dolphins and whales porpoise for air, and seals hunt for fish in the rips, leery of the sharks in the depths. The sea is alive. Nice, healthy fish caught with good friends is what it’s about. After a day of nonstop bass action, the sun is getting low, and we start working our way south toward the ramp. A couple of miles off the beach, Cory spots an enormous blitz a hundred yards ahead of us, but something is different. On the edge of the bait bombardment, 100- to 250-pound torpedoes fly through the water, leaving enormous holes in the ocean. We’ve come prepared. The big sticks wait in the T-top launchers with tuna plugs. The calm, controlled professional anglers suddenly become mad with the chaos of 60-mph fish looting the waters. 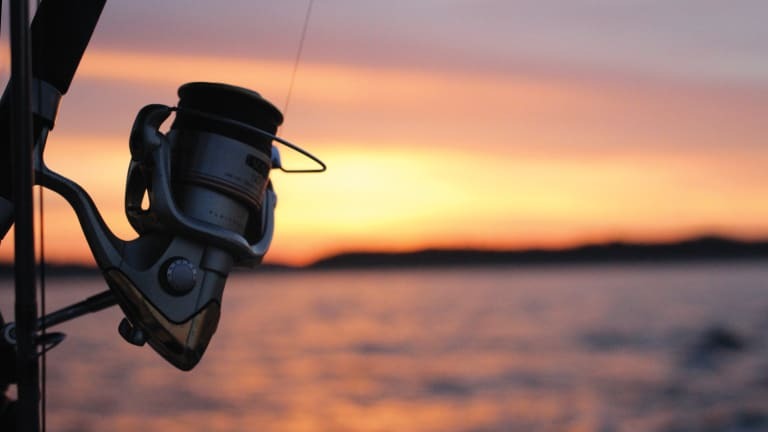 We fly to the rods, cast quickly and make hurried retrieves. After each presentation, we throttle up and move back in front of the lightning-fast tuna for another shot. On his second cast, Cody comes tight and sets the hook with purpose. The fish peels off drag, but to our dismay, the sound quickly subsides. Cody pumps the fish to the boat: a 30-pound bass, one of the nicest of the day, but its quality is lost on us in the mayhem. Our focus in these frantic moments is on tuna. We shake the hooks loose as fast as possible to chase the big boys again. On the rare days when tuna are close to shore and mixed with bass, they give us tunnel vision. And as quickly as they appear, they are gone. At the end of the three-day trip, our bodies are tired. 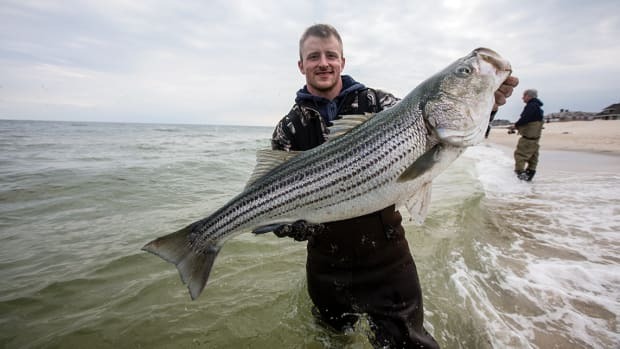 The cold, deep water and ripping currents energize these stripers, and their strong, steady pull has taken its toll on our arms and shoulders. Our fingers are sore and chewed from grabbing leaders and lipping fish. It’s a satisfying feeling to achieve “striper thumb,” which only comes when a person grabs enough stripers that his skin is ripped by their sandpaper-grit mouths. This much-needed trip has been the antidote to winter. For most people, this time of year signifies the start of striper season, but I will soon depart to Bristol Bay, Alaska, for the summer. Cory will start his offshore trips, and Cody will return to his work at the Virginia Institute of Marine Science. We are already thinking of next season, when the cold Cape salt spray welcomes us into spring once more.